Each Monday, I'm going to recommend a classic movie you should see (for the reasons behind the 1001 series and reviews of earlier films covered go here). This month I'm celebrating Easter with three films that are related to the spring holiday. 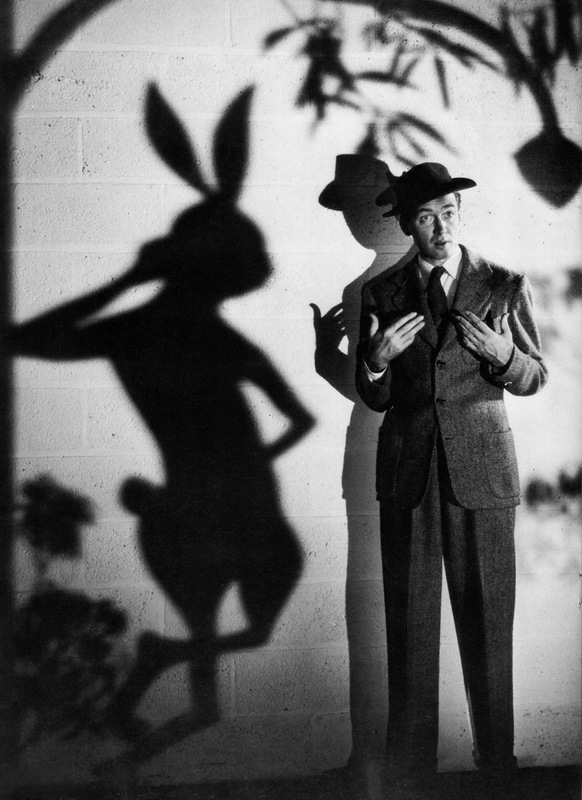 First up is the comedy/fantasy Harvey (1950), which stars James Stewart as a mild-mannered man whose best friend is an invisible rabbit. Harvey begins when society matron Veta Louise Simmons (Josephine Hull) is trying to get her younger brother Elwood P. Dowd (Stewart) out of the house so she can host a debutante party for her gawky daughter Myrtle Mae (Victoria Horne). Elwood is a lovable lush whose best friend is an invisible 6 foot 3 1\2 inch white rabbit named Harvey, whom he introduces to everyone he meets. When Elwood and Harvey unexpectedly show up at the party, Veta decides she must take drastic steps and have Elwood committed to a local sanitarium. Harvey is based on the 1945 Pulitzer Prize-winning play by Mary Chase. The play became one of the most successful to ever appear on Broadway, and it set off a bidding war for the screen rights. 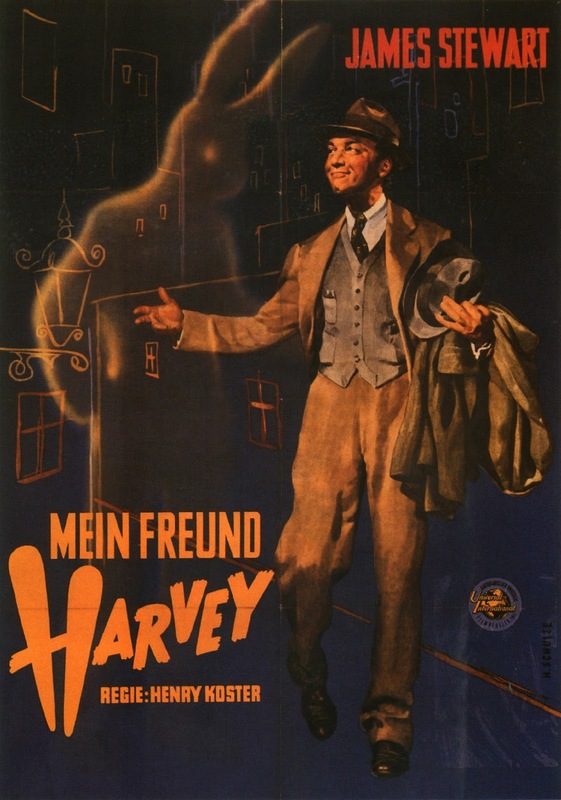 Universal Pictures paid a then record million dollars, and hired many of the actors who had appeared in the stage play for the film version (Stewart had appeared in a six-week run as Elwood, and Hull, Horne, and Jesse White, who plays a gruff sanitarium orderly, were all veterans of Harvey's Broadway run). The result was an endearing family classic that earned Stewart an Academy Award nomination, and has grown in popularity in the decades since thanks to cable TV and DVD sales. 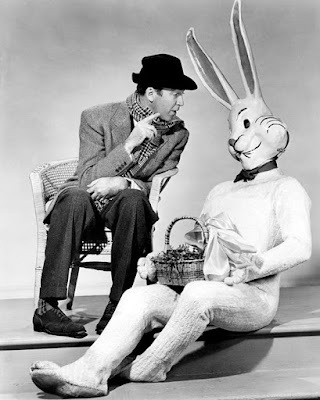 Harvey isn't technically an Easter movie, although the film often gets revived during the holiday season (TCM is airing it on the Saturday before Easter). The image of a large white rabbit with magical powers brings to mind the Easter Bunny, although Chase based the character of Harvey on Celtic legends she learned from her Irish mother. In the film, Harvey is a pooka, which is a fairy spirit that takes the shape of an animal. Harvey doesn't share all of the characteristics of a traditional pooka (read more here), but he does appear and disappear at will, pull practical jokes, and he enjoys a friendly chat. 1. Depiction of Harvey. Chase was adamant that Harvey should actually appear in the film -- she didn't want audiences to leave the theater believing Elwood was nothing more than a hallucinating drunk -- and while several variations of a man in a rabbit costume were filmed for the final scene, director Henry Koster tossed them all aside. 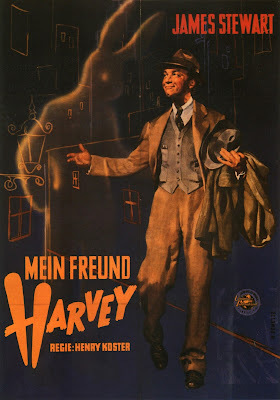 In the final film, Harvey is only shown in a portrait with Elwood. 2. Psychiatry. Harvey is part of a glut of Postwar movies about mental health treatment (see The Snake Pit). It is unique among these films in rejecting psychiatric treatment as a cure for society's ills. 3. Stewart. Although Stewart later criticized his performance in the film as too "cute-cute," Harvey remains one of the touchstone roles in his legendary career. In fact, it cemented Stewart's old Hollywood comeback after enduring a series of flops in the late 1940s. 4. Hull. The stage veteran deservedly won the best supporting actress Oscar for playing Elwood's frequently overwrought sister. She is consistently the most hilarious actor in the movie, especially when she is confessing to a bemused psychiatrist (Charles Drake) that she can sometimes see Harvey. James Stewart chats with Harvey in a publicity still. Other critics: Harvey has an 84 percent fresh rating at Rotten Tomatoes and Leonard Maltin writes that "Stewart gives one of his best performances as tippler Elwood P. Dowd" in a 3 1\2 star review in his Classic Movie Guide. Critics in 1950 had mixed opinions of the movie. Bosley Crowther of The New York Times waxed poetic about Harvey's virtues. "If you're for warm and gentle whimsey [sic], for a charmingly fanciful farce and for a little touch of pathos anent [about] the fateful evanescence of man's dreams, then the movie version of Harvey is definitely for you," he wrote. However, the Time magazine critic was less than impressed. "Unhappily, what the film also borrows from the play, and somehow makes more conspicuous, is a tendency to drag its feet for long stretches, especially during the virtually actionless last third of the story." The bottom line: There's a reason Harvey is one of the best-selling classic movies on home video. It's a heartwarming film with iconic performances from Stewart and Hull and truly memorable dialogue. Availability: Harvey will air on TCM at 8 p.m. April 15 and at 6 p.m. June 20. It is available on DVD and video on demand. Next week, I'll continue the April theme of Easter movies with Judy Garland and Fred Astaire in the musical Easter Parade (1948).